May is going to be a big month. On a personal front, I hit the quarter-century mark. 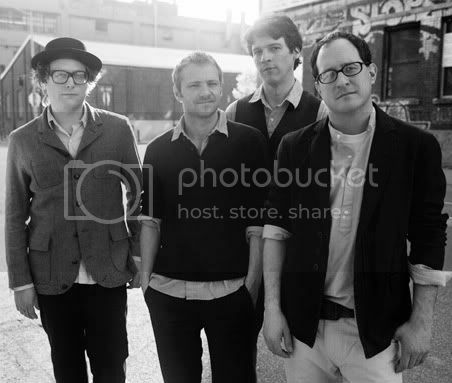 So those of you looking for gift ideas, throw this one on the heap: Take-no-prisoners barroom brawlers The Hold Steady (sans Franz) will release a new album, Heaven Is Whenever, in May. They'll join Broken Social Scene, The New Pornographers, Josh Ritter, and the National in doing so. One thing we've never really tried was writing in the studio and using the studio itself as an instrument. By throwing around buzz words and phrases like "experiment", "sonically diverse", and "using the studio itself as an instrument", you'd think Tadd might be reneging on his Radiohead hate. But this could just mean that a few more slow songs turn up. Who knows! What I do know is they better get back to Charleston and soon. Hopefully my tinnitus from the Isbell show will have cleared up by then. *Also applies to boys and girls in other countries.